Miramar Peninsula Ciclovia is back, lasting longer and happening more often. “Ciclovia” (pronounced “seek – low – VEE – uh”) is a simple concept – close a road to cars and open it to people. Almost 2500 people participated in the first Miramar Peninsula Ciclovia in February 2014. Ciclovias reflect an increased interest in active transport, ways of getting around that aren’t contributing to climate change. 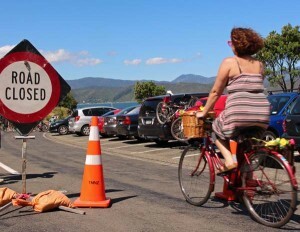 On three Sundays this summer (8, 15 February, and 8 March 2015), Massey Road on the Miramar Peninsula between Shelly Bay and Scorching Bay will be OPEN to cyclists, walkers, roller bladers, scooters, skateboarders and people using wheel chairs and mobility scooters. The road will be CLOSED to motor vehicles. The Ciclovia will last all day – from 6am to 10pm. The Miramar Peninsula is one of the jewels of the Great Harbour Way/ Te Aranui o Poneke – the walking and cycling route around Wellington Harbour. Ciclovia gives people a chance to experience the seashore and views of this stunning section, without the distraction of motor vehicles.Ciclovia is also an ideal opportunity for novice cyclists and families with young children to practice their riding skills in a motor free environment. When you need a break, you can revive at the cafes at each end of the Ciclovia: Chocolate Fish at Shelly Bay, or Scorch-o-Rama at Scorching Bay. Motor vehicles will be present on Shelly Bay road between the Miramar Cutting and Shelly Bay, and on Karaka Bay Road from Worser Bay to Scorching Bay. Normal road rules will apply here, though we’ll be asking motorists to slow and take extra care as families will be accessing the Ciclovia on these roads. The 2015 Miramar Peninsula Ciclovia is a trial for making the Miramar Peninsula motor free every Sunday. So get on your walking shoes, bike or scooter, and join Miramar Peninsula Ciclovia 2015!